I decided to live on the wild side a little bit and try out a StrideBox. I signed up on January 8th and was put on a "waiting list" and though I don't remember when I was finally ready to join the cool kids' club, my StrideBox was mailed on February 7th, receiving it on February 15th. The box cost $15.00, which included shipping. 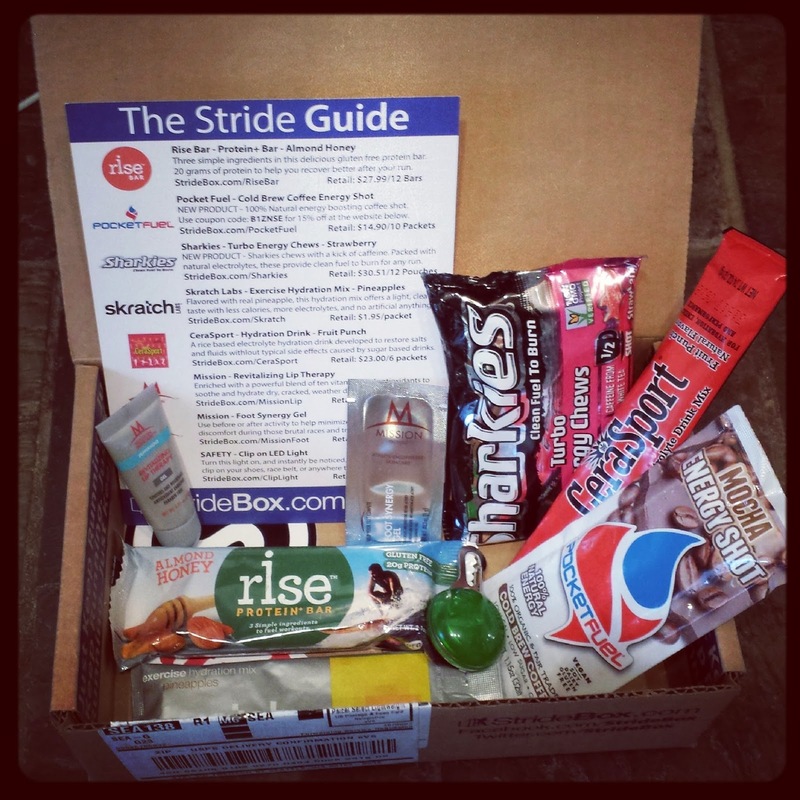 Guessing StrideBox likely provides many of these to bloggers for shiny, happy, glowing, OMG! reviews, I, however, purchased my own, so I get to say whatever the heck I want to about what was in the box. So what is in this box? 1. Rise Bar- Protein+ Bar in Almond Energy retails for about $2.33 per bar (box of 12 bars is $27.99). One 2.1 ounce bar in the box. I decided to take this along as a post-run snack on Sunday. First impression was that the flavor was okay, but the texture was sort of wrong. Kind of a homogeneous chalky/chewy type thing going on. About half way through the bar I decided to look at the nutrition label and almost lost my, err, bar. 16 grams of fat in one bar? I wrapped it up and threw away the rest. Verdict? Would never, ever buy this bar. Ever. 2. Pocket Fuel- Cold Brew Coffee Energy Shot in Mocha retails for about $1.49 (box of 10 packets is $14.90). One 1.15 ounce packet in the box. I have always been intrigued by this company, so it was exciting to get a sample. I don't, however, like to take in any extra caffeine while exercising, since I never know how it will affect me (sometimes not at all, sometimes I get light-headed and shaky), so that is a bummer that this gel has 70mg of caffeine per packet. Pocket Fuel has many less calories than Gu or Clif Shot gels (my two perferred gels). Only 33 calories per pouch! Anyways, I likely will give this away. 3. Sharkies- Turbo Energy Chews in Strawberry retails for about $2.54 per pouch (box of 12 pouches is $30.51). One 1.58 ounce packet in the box. This item also has caffeine in it. I couldn't find the exact amount, but it says "1/2 shot" in a picture of an espresso cup on the front, and a 1/2 shot of espresso has around 35mg of caffeine in it. The pouch has two servings, so I would guess that it has that much caffeine per serving? Not entirely sure. The chews are yummy and are coated in sugar. I liked them and ate them before my long run on Sunday. Verdict? I would consider buying another non-caffeine variety of Sharkies. 4. Skratch Labs- Exercise Hydration Mix in Pineapples retails for $1.95 per packet. One 0.8 ounce packet in the box. This was probably my favorite food item in the box. The flavor wasn't overly artificially sweet and I liked the pineapple as an alternative to the other drink flavors I have tried. 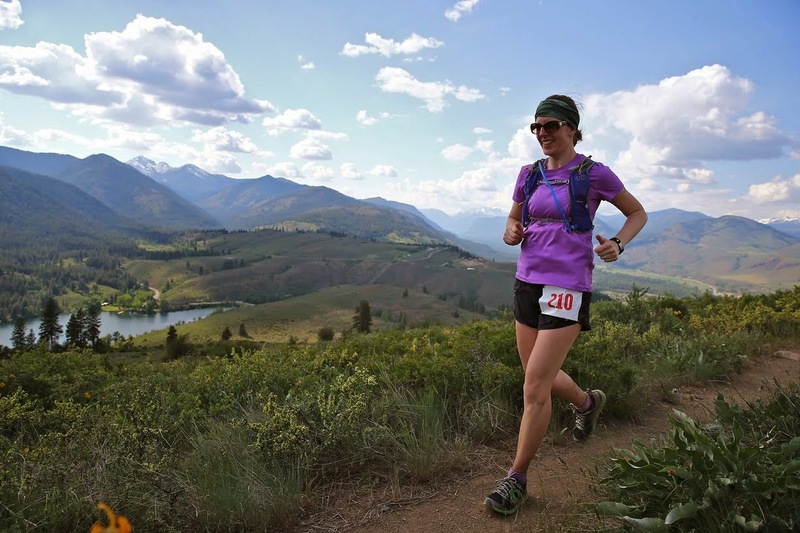 It was a pouch of powder that mixed up easily and I drank it after my long run on Sunday. It hit the spot! At $1.95 per drink, however, that's a little steep. Verdict? It was yummy, but I wouldn't ever buy it for that price. 5. CeraSport- Hydration Drink in Fruit Punch retails for about $3.83 per packet (box of 6- 21 gram packets is $23.00). One 21 gram packet in the box. This is also a pouch of powder, one pouch makes two 16 ounce servings. It was the first thing I tried out of my box. The taste is . . . okay. Not very sweet, which is nice. I was not a huge fan of the artificial taste of the sweetener, which appears to be stevia. It was a little tricky to mix up, I am too spoiled by the nuun tablets that dissolve nicely, I suppose! Verdict? Would not purchase again, especially not at that price point. 6. Mission- Revitalizing Lip Therapy retails for $3.99 for a .25 ounce tube. One .25 ounce tube in the box. This lip stuff is fine. Tastes and smells similar to what I remember a tube of Carmex tasting/smelling like. I like it and will use it. Verdict? I wouldn't buy it for $3.99 a tube. I prefer Burt's Bees. 7. Mission- Foot Synergy Gel retails for $7.89 for a 2 ounce tube. One .033 ounce packet in the box (this works out to basically pennies). I didn't get a chance to try this before I published this review, but unless it gave me so much energy that I was able to run for hours with zero fatigue, I wouldn't buy a tube of foot gel. I am REALLY glad they put a light in the box! It either stays on or blinks or is off. I needed a light for Ragnar, so that's a score! It's nothing fancy, just a about 1 1/2" in diameter with a clip on the top. Verdict? I am glad it was in the box, would have bought this anyways. When added up the value of the contents, when purchased at the retail prices listed on the "Stride Guide", it comes out to just under $17.00. So, it's not like you're getting a real deal on any of this stuff, I would look at it more like you're paying for a fun sample of products that you might not otherwise get to try. Overall impression? Eh. It was fun to try some new things, even if I didn't love most of it. I will get at least one more box to try before I decide StrideBox isn't for me.